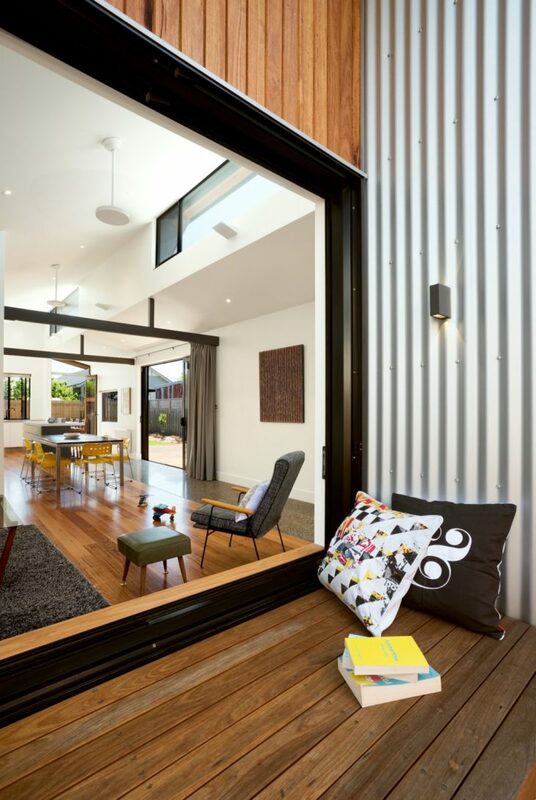 Green Sheep Collective designed this stunning sustainable single family residence located in Melbourne, Australia. Take a look at the complete story below. 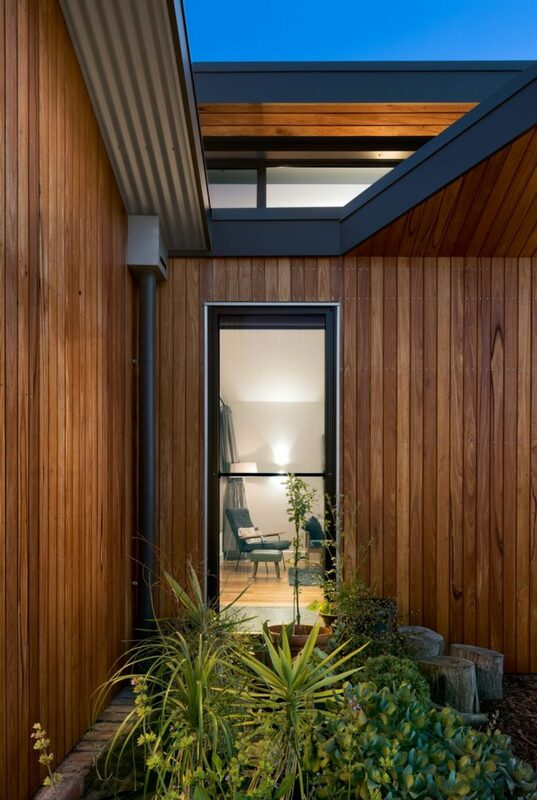 The Northcote Solar Home in Melbourne combines high-level environmentally sustainable design with a striking roofscape, contemporary finish, flexibility and a focus on outdoors and family. 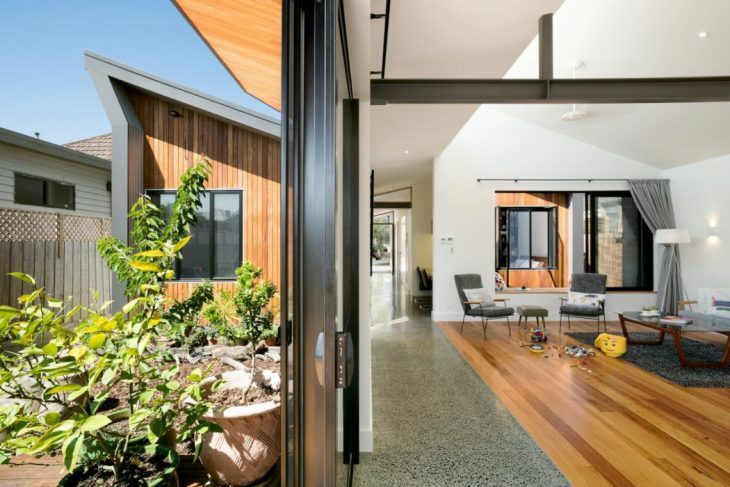 The client, a family of four, had a brief to create a sustainable home that connected with the garden and accommodated the family’s changing needs. The raked roof is an economical solution, utilising no more or less than is required to achieve its goals. It acts to provide north light to all spaces and allows natural ‘stack effect’ ventilation to further enhance the efficient, sustainable, low energy qualities of the building. All rooms are bathed in northern light through operable clerestory windows defined by the twin raked roof forms embracing the sun. 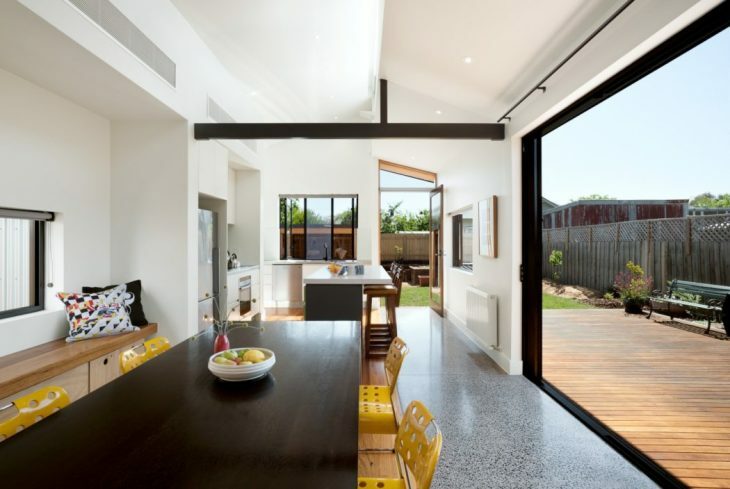 Passive heating and cooling is further assisted by north facing living areas, courtyards, strategically positioned thermal mass in the concrete floor, a high level of insulation, and thermally improved aluminium window frames with low-e double-glazing with appropriate eaves and external blinds. 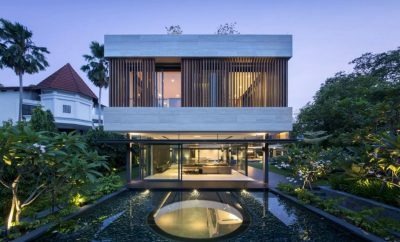 The home’s three side-by-side pavilions are divided by courtyards that give every room a connection to outdoor space, while providing natural light and ventilation. 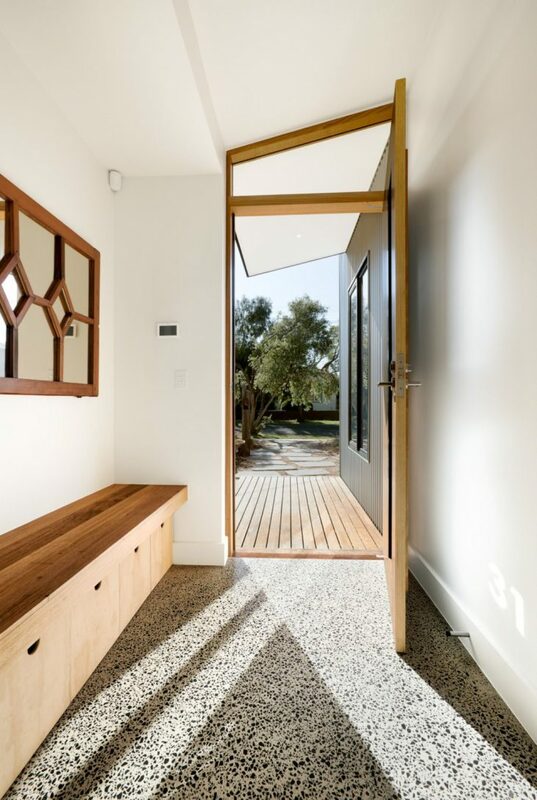 A central polished concrete corridor runs the length of the home with living spaces set to the southern boundary to allow connection with a large north-facing garden area. 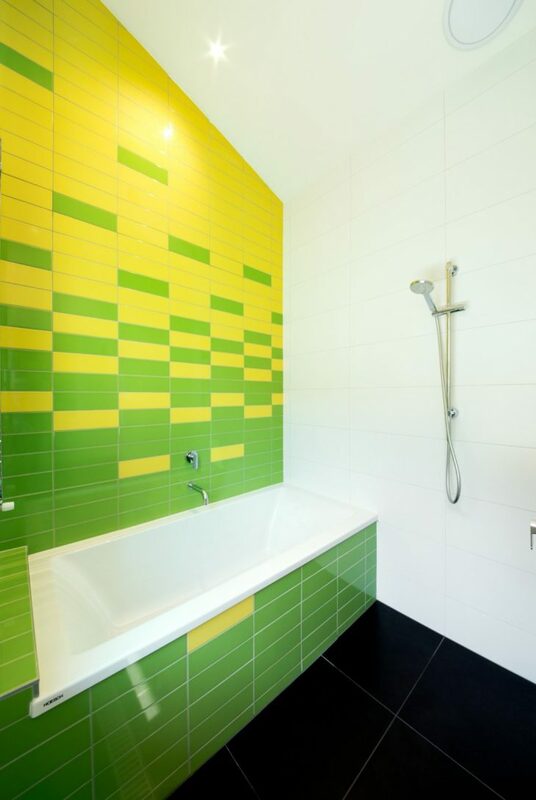 These measures guarantee a reduced dependence on artificial heating, cooling and lighting. 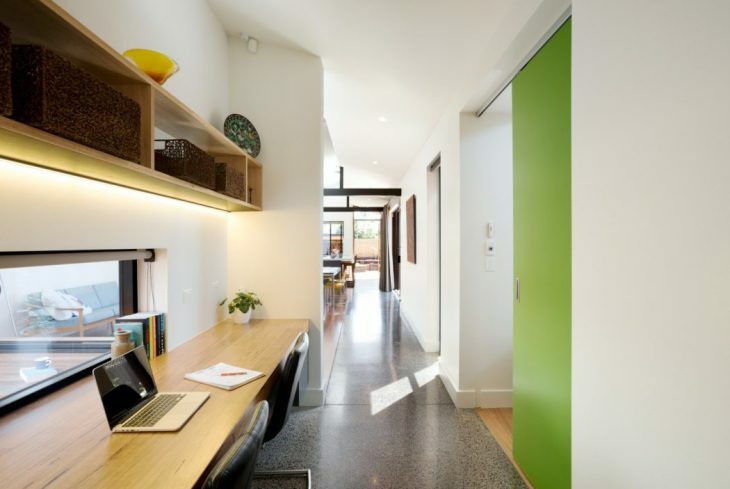 The flexible layout minimises circulation space, with the study and laundry both integrated within the circulation space to maximise the efficiency of otherwise under-utilised hallway spaces. 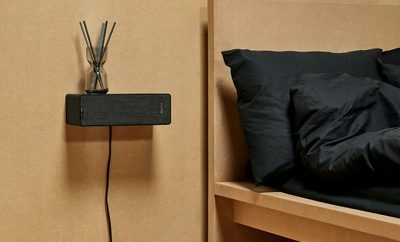 Built-in furniture and concealed pelmets further maximise these efficiencies, thereby reducing construction materials, energy use, resources, and maintenance. 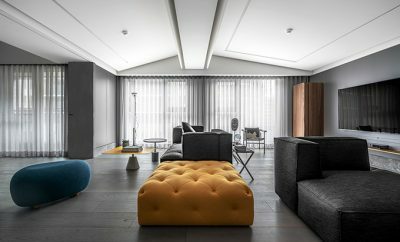 ‘Flexible’ rooms created by the use of large sliding doors, allow spaces to expand or contract to create multi-functional spaces. 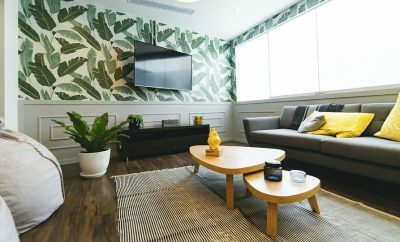 Here, the living area converts from an open plan living space into a more private guest bedroom type area as required. A north-facing deck extends the dining space outdoors, while the central courtyard deck doubles as integrated living room seating. The north-facing kitchen window further connects the garden areas, providing outdoor bar seating to the kitchen and deck. 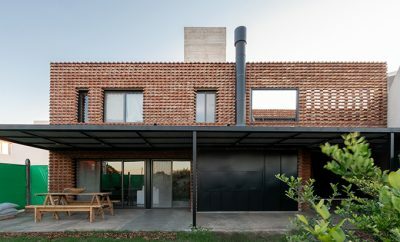 Two of the more unique aspects of this building are the external wall and roof structures, each of which have been designed to massively increase the amount of insulation the house could accommodate. 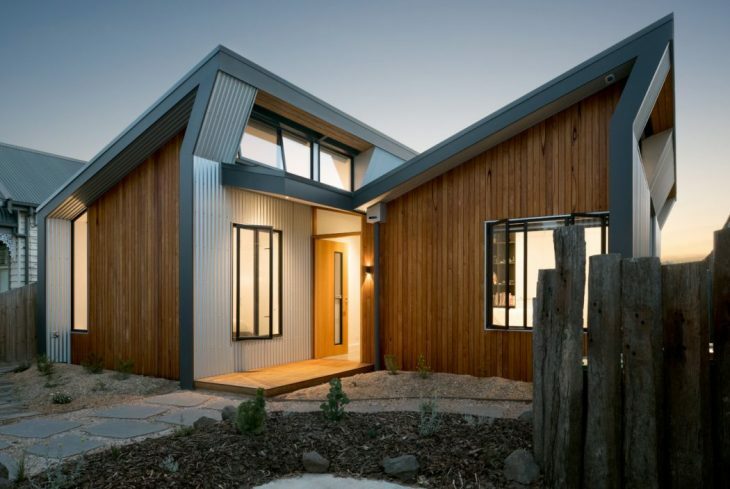 A double studwork structure to all external walls allowed the house twice the amount of insulation (R5.0), maximising thermal efficiency and creating a stable, comfortable and quiet home at nearly double the NCC minimum. 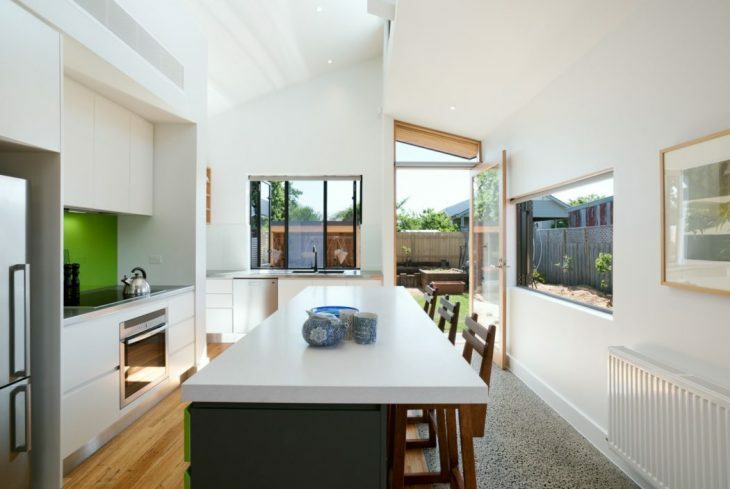 In addition, implementation of an oversized roof structure enabled R5.0 bulk insulation to the raking ceilings, having a sizable impact on the temperature stability, acoustics, comfort and energy efficiency of the entire home. 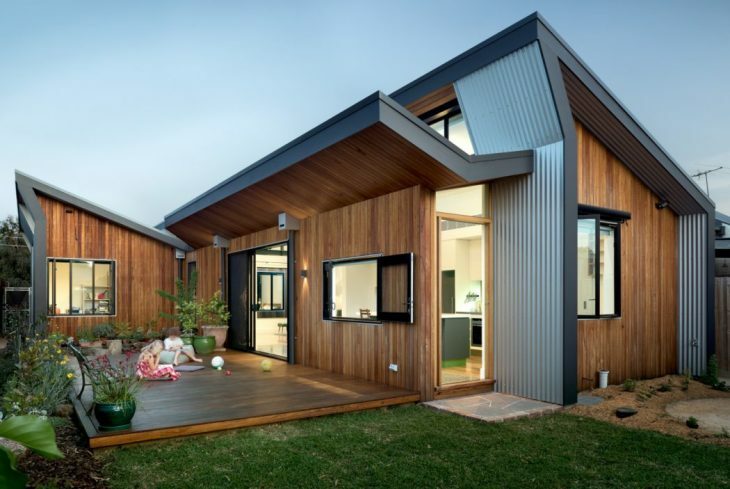 Enveloping the lightweight structure is low-maintenance, long-lasting corrugated metal roofing and wall cladding protecting the home, combining beautifully with radially sawn timber cladding used in strategic locations.